The African gray parrot is about 13 to 14 inches long. While these birds live in lowland forests, they do visit savannas and open woodlands to feed. They are found scattered over their range, and seem to be extending their range eastward into Kenya, Uganda, and Sudan. Large flocks congregate in tall trees near forest edges. They leave at sunrise in pairs and small parties and fly to the day's feeding grounds. They fly high above the treetops and call loudly. At dusk they make the return flight, with many arriving well after sunset. It is unusual for most birds to fly extensively after sunset. Because they sometimes raid crops they are persecuted in some places, and usually cannot be found near villages. Newly-hatched young are brooded by the females only, while the male brings food for the female and the young. The young leave the nest in about 10 weeks. Many people consider these the best talkers among the parrots and keep them for that reason. However, the good talkers are almost always captive bred and hand-raised from a very young age. Mature birds usually cannot be taught to talk. 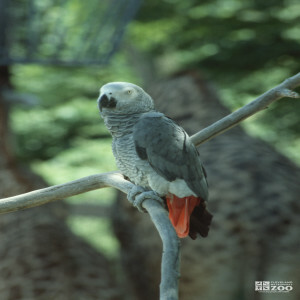 The African Gray Parrot's range is Central Africa from Gulf of Guinea to Lake Victoria. The African Gray Parrot inhabits Lowland forests. While African Gray Parrots live in lowland forests, they do visit savannas and open woodlands to feed. They are found scattered over their range, and seem to be extending their range eastward into Kenya, Uganda, and Sudan. Large flocks congregate in tall trees near forest edges. They leave at sunrise in pairs and small parties and fly to the day's feeding grounds. They fly high above the treetops and call loudly. At dusk they make the return flight, with many arriving well after sunset. It is unusual for most birds to fly extensively after sunset. Because they sometimes raid crops they are persecuted in some places, and usually cannot be found near villages. African Gray Parrots nest in tree cavities, high up in trees. Newly-hatched young are brooded by the females only, while the male brings food for the female and the young. The young leave the nest in about 10 weeks.